You all know that I'm a big fan of Danielle Steel and all her books. The reason I love her books is because of the women in them. Her protagonists are normal woman who go through day to day life and the problems that come with it. While some are strong from the start, some slowly find their strength and themselves through the story. There is nothing more awesome than reading about a woman regaining her own strength and believing in herself and then sorting out her life. No matter what challenge comes her way, she gets past it with aplomb and a set of lessons. They in turn teach the reader so much about life and how you can make it. 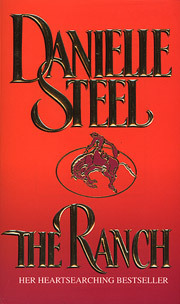 Life's stories are what Danielle Steel specializes in and that's the main reason I love her books so much. When I wrote about her for D, I also wrote about the first book of hers that I read thanks to my wonderful librarian who saved the book for me and let me have it for myself. 'The Ranch' has remained one of my favorite book since that day. The book is about three women and their friendship through their years. Mary Stuart, Tanya and Zoe have been best friends through college, but regular life catches up and they get busy. While Mary Stuart is in a boring marriage and is caught up with her charity work but is still crippled with guilt over her son's death, Tanya Thomas is a award winning singer and a rock star who is trapped in the web of fame, success and a broken heart, Zoe Phillips is a doctor and is a single mother to an adopted two year old son and she is my favorite character of the lot. Despite all the changes in their lives, the friendship they share is still a bond they all treasure. They meet up at the Mary Stuart's ranch in Wyoming once in a while and the few weeks that they spend together becomes an outlet for healing and release. Zoe clearly is the most liberal of the lot and marriage was never on her cards. Unlike her friends, marriage never features in her dreams and it is not something she coveted or shared with them. Zoe's a doctor at an AIDS clinic in San Francisco and all she cares for apart from her new son is her patients and their well being. Her busy life leaves her with no time for herself. But then something happens and she is forced to reevaluate her future and her current life . So what happens and what makes Zoe the best character in the lot? An infected needle accidentally pierces Zoe and she is diagnosed as HIV positive. Her whole life comes crashing down and she realizes that she needs all the strength and courage she has to get through this. Trying to make amends with her new son and yet take care of her patients, she loses her strength and slowly begins to crumble as the disease catches up. Still she makes the effort to head to Wyoming to spend some time with her friends. She breaks the news to them and they give her the courage and strength she was lacking. Slowly she finds her mojo back and is back to fighting the disease with all that she's got. As a reader, I felt so proud of her. First, for what she was doing to make an impact in other people's lives. Next, for deciding to be a single mother. And then, for how she handled her life when it was unfair to her. She never gives up on her friends, nor on herself. While she derives strength from them, she also helps them sort out their lives. Together these three women handle life brilliantly. First, their own. Next, that of their friends. Their friendship stands out throughout the story and while each woman has their own strength, Zoe completely stood out for me. Her take on life, her broad-mindedness, her kind heart and then her strength and positivity was something that I learnt a lot from. She was me in more ways than one and I soon became her. I did not have to battle a disease like her, but I have battled so many other things over the years that was no less than a life threatening disease. And Zoe has inspired me through every phase of life and will continue to do so. When my best friends decided to call me Zoe for other reasons, I connected it to this and was more than happy with my new nick name. Till date, only four people are allowed to call me Zoe, but they don't know why I cherish it so much. I dont think I have read The Ranch. Your post has compelled me to add this book in my TBR. After reading all about books at your space this April, I can say that our reading tastes match a LOT! We have read quite similar books and I have added many books in my TBR. Thanks for a wonderful April and congratulations for completing this challenge. Cheers! Ahh The Ranch, loved the book! It's amazing how three completely different broken lifestyles of the three women come together and figure a way out of this mess. It's beautiful. The only other book I've read of Danielle Steel is Secrets, and I must say her writing does stand out. I love how her stories are about dealing with the difficult truths of life.